The following tutorial uses advanced methods for troubleshooting Verifier conflicts with Windows. If you are not comfortable manually changing registry settings, please do not continue. First, you will need to access the Windows Recovery Options. 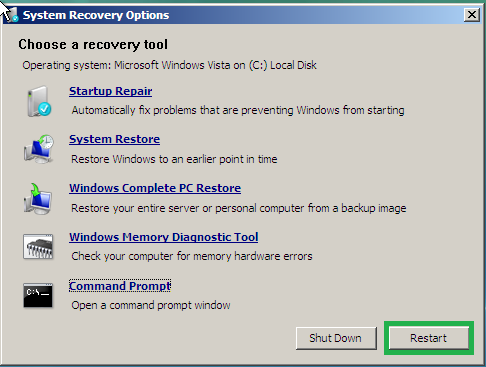 Once you have access to the Windows Recovery Options screen, choose the command prompt. Determine which drive contains your Windows Directory by checking the directory structure for all drives. The example below checks the c:, d:, and e: drives, but you may need to check others. The drive will not be the x: drive since the x: drive is a virtual drive in memory that contains the Windows recovery files. In the example below, the drive containing the Windows directory is the c: drive. The registry loaded in the recovery options environment contains only registry entries for allowing the recovery options to run. It does not include the registry information installed on the system. You must first load the registry from your system into the recovery options registry before you can disable Verifier through the Windows recovery options registry editor. 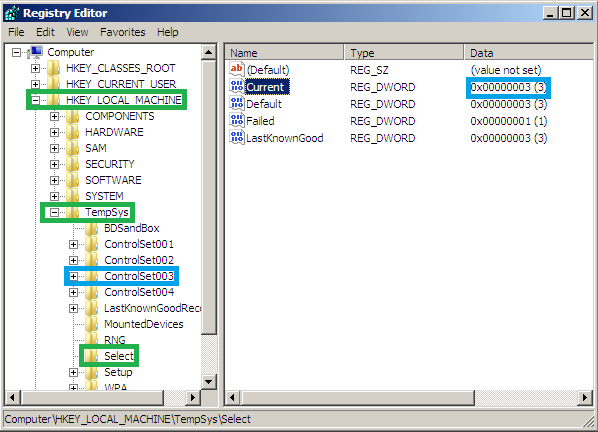 Once the registry is loaded as TempSys, run the registry editor using the following command. Browse to HKEY_LOCAL_MACHINE\TempSys\Select and then read the Current DWORD entry. The DWORD entry will have a number that corresponds to the ControlSet that is in use when the system is loaded. In the below example, the DWORD number is 3, so ControlSet003 contains the Verifier information when Windows is loaded. Navigate to HKEY_LOCAL_MACHINE\TempSys\ControlSet00#\Control\Session Manager\Memory Management\ where # is the number found in the Select DWORD entry. Delete the VerifyDrivers and VerifyDriverLevel keys. Unload the registry key for TempSys. I came across the steps months ago, and I was reminded of them today due to a thread at TSF in which a user could not use System Restore to restore to a point before enabling Verifier. Verifier was causing crashes on boot, and Safe Mode could not be accessed in Windows 8. The registry steps worked perfectly, so I thought I would create a tutorial here for future reference to users with similar problems. Doesn't happen too often, but it is good to have the option to help users disable Verifier in the instances that it cannot be disabled through normal methods. We may encounter this more now with Windows 8 and the inability to reach Safe Mode using F8 as in the past. Thanks. I spent hours looking for something like this. Awesome tutorial! I understood everything, even though I couldn't see the pictures. School filters and all. You have to work at Microsoft !!!! Know things :thumbsup2:better than they !!!! writhziden: thank you so very much! I'm on windows server 2016 and the only way it boots up is w/ "disable driver signature enforcement", so I tried the verifier tool which made matters worse. Your post got me back in! The links are mostly dead, consequently, I can't see almost any of what I need to see to use this HOWTO. Any chance you could update it? The markup probably needs changing for the images to show, and I'll investigate the broken links tonight. Thanks for raising this! I've fixed the image attachments now. I'm not sure if the original threads have been deleted or just moved to an inaccessible location? Links have now been updated. why I'd like to be able to have it on paper if I can't get a machine to boot. Hopefully I'm not asking too much.